On my way up to the Lake District to visit L’Enclume I was very happy to stumble upon The Bay Horse Inn, just off the M6 a few miles outside of Lancaster. 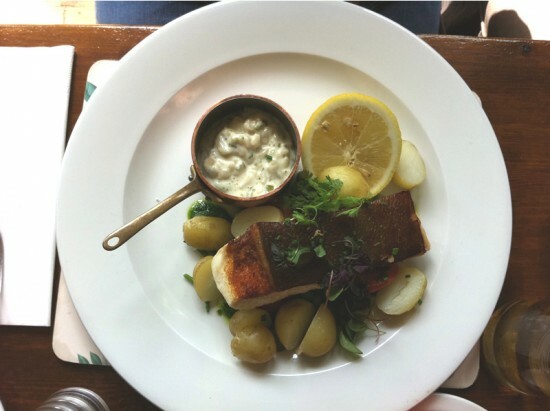 It has won numerous ‘Gastropub’ awards and been featured in the Michelin Pub Guide, the website promises to deliver ‘Modern Rural British Pub Food, making great use of the products available from local suppliers’. It sounded like the ideal place for a quick lunch. Driving up the long gravel drive on a gloriously sunny day the white washed building stood out and looked very inviting. Inside was smaller than I expected but very cosy and traditional. I imagine it would be a lovely warming place to come for a Sunday roast on a cold winters day. We were seated by a window with a gorgeous view, think huge fields, flowing rivers and roaming cows. Orders were taken promptly and starters arrived quickly. I had a salad of smoked salmon and goats cheese which was perfectly balanced and delicately flavoured. My partner had a black pudding dish which despite looking huge was incredibly light. Served with an apple puree it was delicious. Main courses were equally good. I had roast chicken breast with mashed potatoes, peas and gravy. A very simple dish but a joy to eat when cooked properly and this certainly was. The chicken was juicy but had an incredible crisp skin, the mashed potatoes rich, creamy and well seasoned and the gravy full of big meaty flavour. It tasted fantastic, my only complaint was that there probably wasn’t enough mashed potato. My partner ordered Pan roasted halibut with new potatoes. Another simple dish but executed perfectly. Soft halibut flesh with a crispy skin, buttery new potatoes and an excellent homemade tartare sauce – served in an attractive looking mini copper pan – with just the right amount of bite brought the dish together. We were feeling a little full by this point and with still quite a way to drive decided against a large dessert, although there were some fantastic sounding dishes. We did end up being tempted by their home made ice creams though. Not only did they taste great but they’re fantastic value too. The peanut butter ice-cream was out of this world good, the Pistachio ice-cream and mango sorbet deserve a mention too. 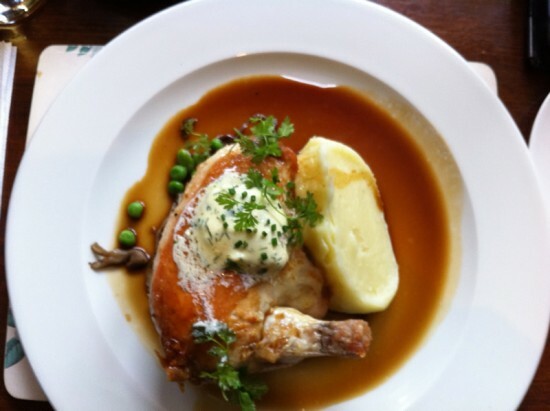 The Bay Horse Inn is a great local pub serving well above average pub food. Local ingredients cooked well in good surroundings. Exactly what I was looking for and i’d be very happy to return.